Like all Chabad preschools, we encourage our children to learn blessings and prayers. 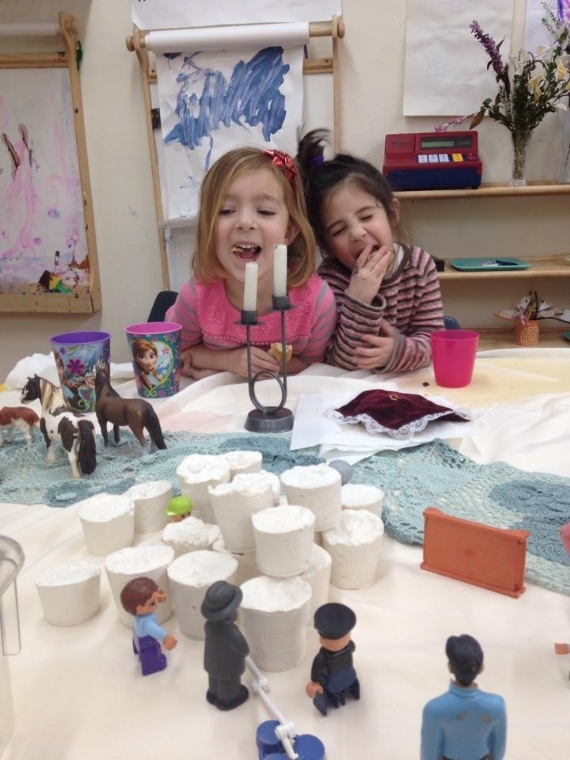 Each week, we tell stories and play games inspired by the parsha, and on Fridays, our school takes on the atmosphere of the arriving Shabbat; we busily prepare for the special day by arranging flowers, polishing silver, cleaning up, baking challah, setting the table, and finally having our Shabbat party. The children eagerly anticipate and prepare for holidays. On Chanukah, for example, we do more than paint dreidels. The children's Chanukah experience is enriched as they act out the Chanukah story, replete with Jewish pride. Love and loyalty to our heritage is naturally infused by our committed teachers, and becomes part of our children's identity. Children are taught at an early age that as part of the larger community, they too have a role to play. Twice a year (on Chanukah and Purim), the Osher children create cards and gifts for the sick and elderly and visit the local rehabilitation center, trailing youth and joy everywhere. Most of our activities are not explicitly religious, but Chabad spirituality influences everything we do. We make a conscious effort to infuse our routines with deeper meaning. We strive to nurture our children's natural sense of wonder and encourage them to experience God's creation as fully as possible. Whether we are melting wax to make candles, collecting acorns in the park, listening to Vivaldi or learning to use sandpaper, there is a powerful undercurrent of gratitude and appreciation for everything around us that is beautiful, unexpected, and inexplicable. Our much-loved spiritual director, Rabbi Yakov Kirschenbaum, drops by frequently for special events and workshops. Rabbi Yakov Kirschenbaum has been leading Chabad of Washington Heights since 2005. Before that, he served as congregational rabbi in Brisbane, Australia as a Lubavitch Youth Organization’s emissary, after completing his rabbinate degree at Central Lubavitch Yeshiva, "770". Rabbi Kirschenbaum has also received clinical pastoral education at Beth Israel Hospital. Since his days in yeshivah, Rabbi Kirschenbaum has enjoyed teaching Torah and sharing the beauty of Judaism with others.